Today seemed like a good day to try making a new green juice. What I came up with was a surprisingly delicious juice that is low in calories yet extremely high in vitamins and minerals. 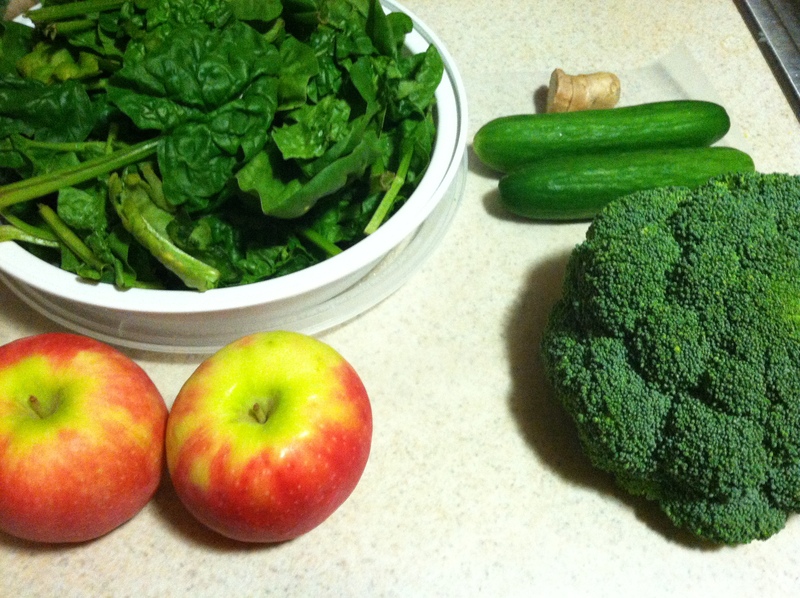 By combining broccoli, spinach leaves, cucumbers, apples, and ginger root, I came up with this new green juice. If you are looking for a new juicing recipe, this is definitely one to try! Simply wash all of your fruits and vegetables and then cut your fruits and vegetables into juicer-appropriate chunks so you don’t overwhelm your juicer. Put everything in your juicer. I don’t really think order matters that much but I’ll tell you what I did. 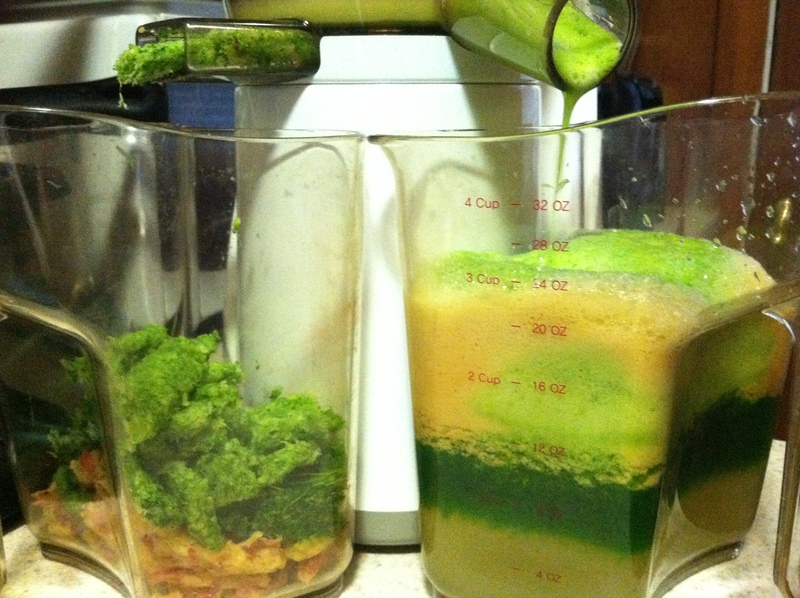 I started with one apple and then moved onto juice the two cups of spinach. I then juiced one of the mini cucumbers and then did the broccoli. I added in the ginger root and finished juicing with the last apple. I think that alternating like this with something like a cucumber or apple which has more juice sometimes helps to keep things moving and helps to avoid clumps of pulp in your juicer. Once you have juiced all of your fruits and vegetables, stir your juice so that all of the different juicers are well mixed. This juice recipe makes two 1-cup servings so you can pour that out into two cups. If you only want to make one cup, then you can simply take half of all of the ingredients above and juice. I think this is a great green juice to have to start off your day. I had mine with a piece of toast and hummus to get some more fiber and protein packed into my breakfast. In one cup of this delicious green juice, you are consuming 152 calories and 34 grams of carbohydrates. You are also getting over a thousand milligrams of potassium and 6 grams of protein. Moving on to vitamins, one serving gives you 18% of your daily vitamin E, 21% of your daily vitamin B-6, 111% of your daily vitamin A, and 276% of your daily vitamin C.
This juice also offers a variety of minerals as well including 11% of your daily copper, 13% of your daily calcium, 15% of your daily iron and so much more. Hello. First off, thank you for your nice words about my juice! Now onto your article you gave me the link to… I did read it and I totally understand what you’re saying about maybe not mixing spinach and broccoli in a juice daily. Though after doing more research into the topic, I found that most healthy people don’t have any issues with oxalic acid. Obviously juicing anything in high amounts should be avoided, and as your article points out juicing high amounts of spinach and broccoli together is when you have an issue. If you are still worried about drinking this juice, you can be sure to drink lots of water before and after to help prevent the spinach’s oxalic acid from binding to the broccoli’s calcium. Also just wanted to point out that most people have a very low chance of developing kidney stones, but if you think you may be at a higher risk for developing them then you should steer clear of this juice completely. Otherwise enjoy sparingly like you suggested! EXCELLANT BUT I ADDED AN AVICOTTO AND I USED GREEN APPLES INSTEAD OF RED. OMG. WHAT A JUICE. !! So glad you enjoyed this juice!! I bet it was quite delicious with the avocado and green apples as well. Excellent recipe. I upped the ginger and added a jalapeno to tweek the ZING factor and loved it! 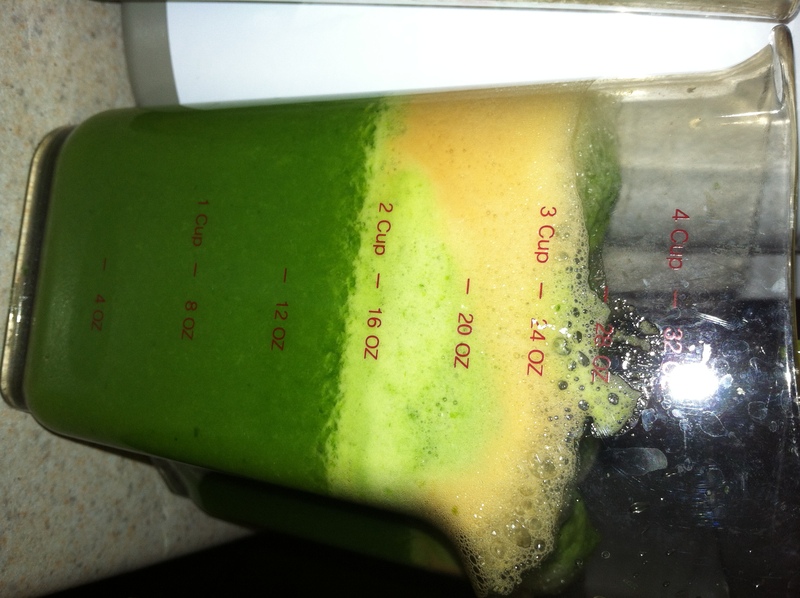 Great juice – green and tasty, thanks for the recipe!